Hurricane Season is from June to November, so be prepared. In August of 2016, we had a close call with Madeline. Steve Businger of UH Mānoa has a great description of Hurricanes in Hawaiʻi, including an explanation of the fortunitous shearing effect of winds aloft vs trade winds that occurs adjacent to the island chain. 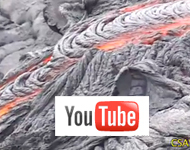 Information on the current eruption: USGS Hawaiian Volcano Observatory. For information and updates about current Hawaiʻi hazards: Civil Defense. IVHHN Vog Dashboard has all the information you need about vog. 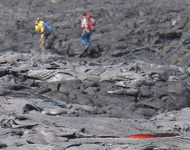 The Center for the Study of Active Volcanoes is a training and outreach program located at the University of Hawaiʻi at Hilo. Our emphasis has always been to provide information on volcanic hazards that occur in Hawaiʻi and worldwide, but we have expanded our program to include other natural hazards as well: earthquakes, hurricanes, floods, tsunamis, and brush fires. There are many web pages that describe the science of natural hazards, and we provide links to these pages. 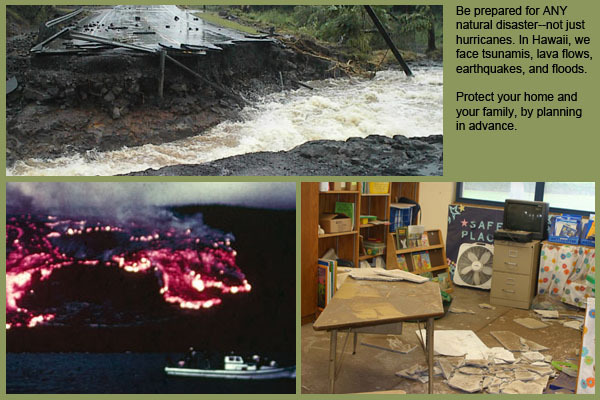 Our hazards web pages emphasize natural hazards in Hawaiʻi and the mitigation steps you can take to protect your property, home and family. You can't stop a natural disaster, but by preparing now, you can lessen its impact on you. Side by side photos showing a grassy area at Richardson's Beach Park at low tide and King Tide. 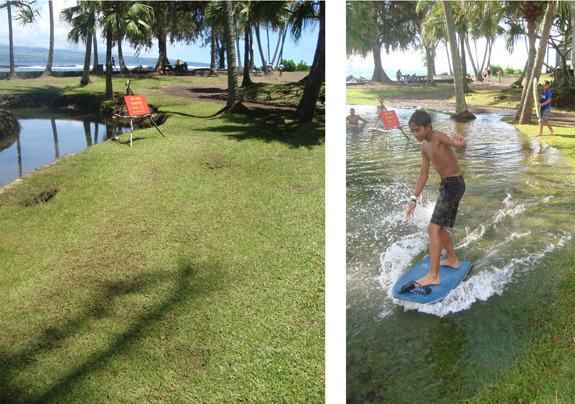 A boy is surfing on the grass during the King tide. Luckily for Hilo, the King Tide of May 2017 did not coincide with high surf in Keaukaha. The side-by-side images above show the difference in low and King tide at Richardson's Beach Park, where brackish fish ponds are just inland of the ocean. If a King tide occurs during conditions of high surf, tropical storm, tsunami, or hurricane, the impacts of these natural disasters will be amplified. Be ready for all natural disasters by planning ahead, and avoiding the areas of impact. Stay safe! Falling branches from albizia trees in Puna blocked miles of roadways. Hurricane Iselle did a lot of damage to Puna, and our thoughts and prayers are with those who lost homes and power. But it could have been a lot worse. When Iniki hit Kauai, almost the entire island was devastated; residents were without power, and without homes, for months. Although Hurricane Iselle severely damaged the Big Island, it was only a Category 1 Hurricane. 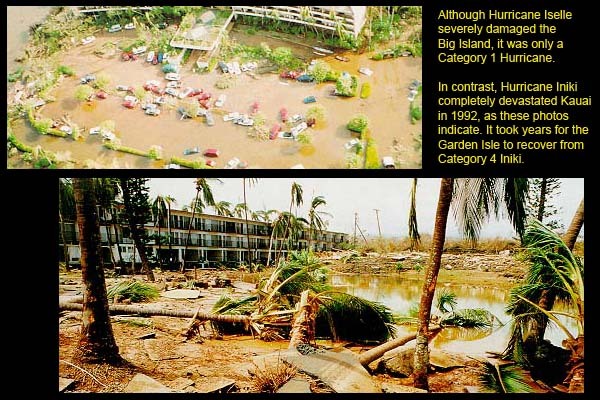 In contrast, Hurricane Iniki completely devastated Kauaʻi in 1992, as these photos indicate. It took years for the Garden Isle to recover from Category 4 Iniki. earthquakes, and floods. Protect your home and your family by planning in advance. 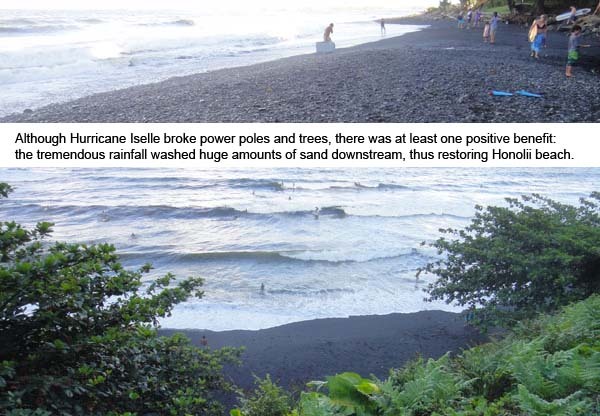 the tremendous rainfall washed huge amounts of sand downstream, thus restoring Honoliʻi beach. Learn how to retrofit your older post-and-pier home with our helpful interactive system. 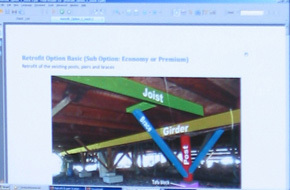 It's easy to use: You plug in the dimensions of joists and girders, and the computer program calculates the material you need to build shear walls. Try out this Retrofit Expert System for yourself. Visit our CSAV channel on YouTube for dozens of outstanding mini videos! Keep up-to-date on Facebook for CSAV events & hazard updates. 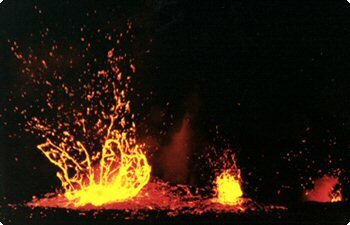 Back to the CSAV home page for details about our volcano programs! “Los desastres naturales no existen. Se presenta un desastre, no por causa de la Naturaleza, sino por la falta de preparacion por parte de la Sociedad.” (Hugo Delgado Granados) There’s no such thing as natural disasters. Disasters take place, not by Nature's hand, but by the lack of preparation on the part of Society.